The Nicky Henderson-trained Might Bite rallied amazingly in the closing stages to edge a dramatic finish after appearing to throw certain victory. Having led, Might Bite under Nico de Boinville, was well clear approaching the final fence, having jumped superbly throughout the three mile contest. However, the son of Scorpion clambered his way through the last fence and subsequently began to hang violently to his right, losing all momentum. However, de Boinville and the eight-year-old heroically battled back to catch the Davy Russell-ridden Whisper, also trained by Henderson, by a nose in the most exciting race many had witnessed, drawing huge cheers from the crowd at Prestbury Park. The Willie Mullins-trained Bellshill was a further 10 lengths behind in third. Henderson, gaining his third winner of the week at the Festival, his 58th winner overall at the meeting and his third RSA Chase, said: This place has extraordinary tricks in its tales and that was another one. "It looked, for all the world, that Might Bite had thrown it away when Whisper came along but to be fair Might Bite was the best horse. "You thought Might Bite had done it all well and then he goes and does that. What can you make of it all? It shows why you should run two in a race or maybe why you shouldn't. "Nico said going to the last he was looking around but it was just quite extraordinary. He came here as a novice hurdler and did exactly the same thing. "He is hugely talented. He is only a baby and hasn't had a lot of experience. It is deceptive how quickly he is going. "The future is enormous with him. I was worried whether Cheltenham would suit him at all but he has showed he handles the place and everything that comes with it because he is the sort of horse I couldn't guarantee was a certainty." Reflecting on Whisper's heroic effort, the Seven Barrows maestro said: "Davy [Russell, jockey] did everything right on Whisper. He did exactly what he wanted to do - hunt around. You could see him creeping in there but you thought Might Bite had got away." Nico de Boinville drove 7/2 favourite Might Bite to a last-gasp victory to record his second win of The Festival 2017 and his sixth in total. De Boinville had a clear lead on the Nicky Henderson-trained eight-year-old at the final fence, but an error there was followed by the horse drifting strongly to the right. His stable mate Whisper, ridden by Davy Russell, headed him on the run-in but Might Bite fought back dramatically to score by a nose in a photo-finish. The jockey said: "I had deja vu there. Might Bite did exactly the same in his hurdle race around here - he saw the entrance to the track where he came in. He was on a perfect stride to the last fence and he's seen that and just lost concentration. He was lugging, trying to get there, and then he saw the loose horse [Marinero] and was like, 'oh right, we are in a race again'. Without that loose horse, I would not have won. "I thought we'd stand a chance of getting back up because he has such a good turn of foot, but it just depended how fast Whisper was coming. If he had been coming any quicker than that, we wouldn't have won. "He is like that. He is a thinker but so talented. He jumped for fun and should have won by five or 10 lengths. It is great for the owners and great for the guvnor [Nicky Henderson], who is having a tremendous time of it. I kept the faith with this horse, although I can see why others might not. "You can just see what a talented horse he is - jumps and travels for fun. He just has his quirks sometimes. You just deal with it and try and make it as easy as you can. "He's got a huge future. 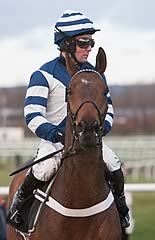 Kempton suits him because the entrance to the track is after the line!" Nicky Henderson saddled his 58th Cheltenham Festival winner when Might Bite landed the RSA Novices' Chase, beating his stablemate Whisper in a dramatic finish. Might Bite (7/2 favourite), another from a long line of stunning-looking Henderson horses, made most of the running, pulled well clear turning in, but wandered markedly right on the run-in, slowed to a canter, and was passed by Whisper who was staying on powerfully. 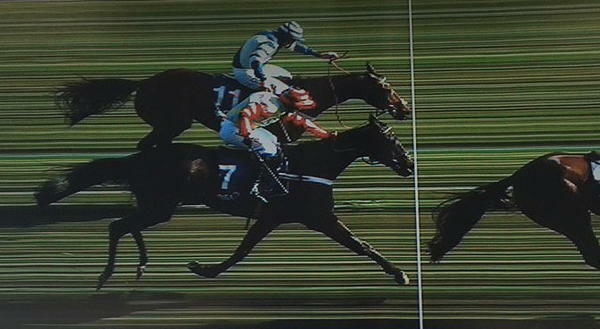 Incredibly, Might Bite rallied to such good purpose that he got back in front to win by a nose, with Bellshill a further 10 lengths back in third. 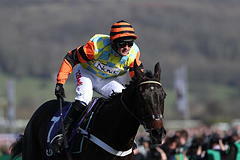 Davy Russell, who rode Whisper, said: "They went quick, and I couldn't go that early pace, so I had to sit and suffer. Nico's horse gave it away on the run-in, by straying, and if anything I got to him too soon. "Obviously, the best horse has won and there are no excuses for my horse. He just kept going at one pace." Whisper's owner, Dai Walters, said: "You go back three years and it was his day when he won the Coral Cup - that was inches and I think there is only a half-inch in this. It was fantastic and I thought he had it! "It's brilliant and it's good for Nicky Henderson. Whisper was in bad form last year and he sent him back [over fences]. It's a credit to Nicky." While Nicky Henderson was welcoming in his 58th Festival winner, a member of his family was experiencing her first. His sister Josephine, who lives in Wiltshire, is one of 10 members of the Knot Again Partnership which owns Might Bite. Others in the group include David Minton, the bloodstock agent who bought Might Bite privately as an unbroken store horse. Josephine said: "It's terrifying to own this horse, but also really thrilling. On the run-in I thought 'Oh God', but he's done that before when winning a hurdle race here. Well done Nico for getting him going again. I couldn't believe he was going to lose it, but after the fall he had at Kempton at Christmas it's so wonderful to have him back and winning. "I saw him in his box as a four-year-old and couldn't help but notice his incredibly long legs. That's where he gets his speed from - he really covers the ground." Bellshill, who fell at the last when a beaten horse at Leopardstown in a Grade One novice chase in February, turned that upset around when finishing third. Willie Mullins, trainer of the 5/1 chance, said: "It was a fabulous race to watch and very brave of the winner to do what he did - extraordinary to do what he did. "It was a very strongly run race and my fellow just wasn't able to go the pace. Bellshill ran well considering his last run - we were delighted. He jumped fantastically and ran well, no excuses."